I'm sure most of you already have a favorite tipple, but for my part I've always found it difficult to find a wine that I really enjoy for the taste. You know, rather than the alcohol content. In general I prefer drinking white wine but for some reason I feel like drinking at home requires red. And I've always found red a bit too heavy. My other problem is that when I do come across one I actually like I have a tendency to forget it's name so I can't find it again. After a particularly hard week when I've frequently wondered at what madness overtook me when I decided to have kids, I stopped by an Esso garage on my way home tonight and lo and behold they had a pretty decent wine section (well I was in Surrey). 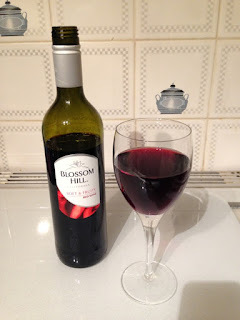 As usual, floundering to make a decision when faced with so many options, I went for a brand I know - a Blossom Hill red. It was only £6 and to be honest I didn't have great expectations, but I've been pleasantly surprised.